Fridays with Fiona & Friday : Kittens going "Nuts"
Here is my first attempt at making my own crafty headband. I ordered some more feathers so I could experiment some more. The feathers available at the local craft stores are pretty boring! This is just peacock feathers and some blue-dye feathers. I needed a couple more peacock feathers to really get the density of feathers that I wanted, but the pad I glued them to is black and it blends with my hair, so it's not that noticeable. However, there will be more experimentation to come! I like the way it looks - it makes my "up-do" hair days a little snazzier. Last year Lifestyle Crafts released "The Letterpress" Machine much to the chagrin of many letterpress owners. When I heard about the machine, the only thing I wanted to know is if you could make your own custom plates. I didn't really care for the idea of creating presses from the same pool of "clip art" that everyone else on the planet would be using. Why I bought "The Letterpress"
I checked out the review by Kristen at Papercrave.com and her update about custom plates. When I found out that you could, indeed, make your own custom plates, I was on-board because I could get the letterpress kit and the Epic Six by Quickutz for 50% of their regular cost with coupons and a partial gift certificate. If it hadn't been for the discounts, I probably would have waited. I bought "The Letterpress" because I wanted something new to play with, I don't have the room or the money for a proper letterpress, and thought this would be an inexpensive place to start. Everything Kristin pointed out in her blog coverage is quite true. The ONLY useful thing in the letterpress kit is the plastic foldy plate that you must have in order to run it through the Epic Six press. The brayer was terrible, the foam stickies to hold your paper in place were hard as HECK to get off the plastic and therefore are not reusable or repositionable, and the plastic plates are HORRIBLE. One of mine was broken when I opened the package - didn't even use it yet. The others cracked upon rolling through the pressure of the machine. They were very cheap quality, so don't even bother with buying any others! I've already contacted them about replacement plates, but I'm not sure why I am bothering! A bonus to having the whole system is that with the Epic Six, you can use it as a die-cutting machine. I haven't done that yet, but for those who scrapbook or make cards, that might be an added bonus. The accessories sold in the stores are bogus. Buy the ink - it seems to be of decent quality and the right size tubes for what you are doing. Buy the paper if you must, but you can buy 250 8.5 x 11 sheets of Crane 110lb Lettra online for $35-$40 bucks plus shipping and that is a much better deal. You can buy a palette knife for mixing inks in an art supply store. Use double-sided tape instead of their sticky adhesive sheets. Get your own brayer! I didn't like the size of their inking block either. Since I bought a 4" brayer (I would recommend a 4" or a 6") the block is too small. You can go to the dollar tree and buy a cheap document size photo frame and use the glass to roll your ink on. As I am not made of money, I'm going to have to wait until I can get a custom plate made. A 6"x8" polymer plate from boxcarpress.com would cost about $35. When I was buying my new Speedball brayer in Hobby Lobby, I saw these thin sheets of linoleum for print-making. They looked to be a little over 1/8 of an inch thick and I wondered if it would work in the little press. So, I picked up a 3"x4" sheet for $1.99 and gave it a shot. The idea was to see if this linoleum would be hard enough and precise enough to make an impression into the paper. 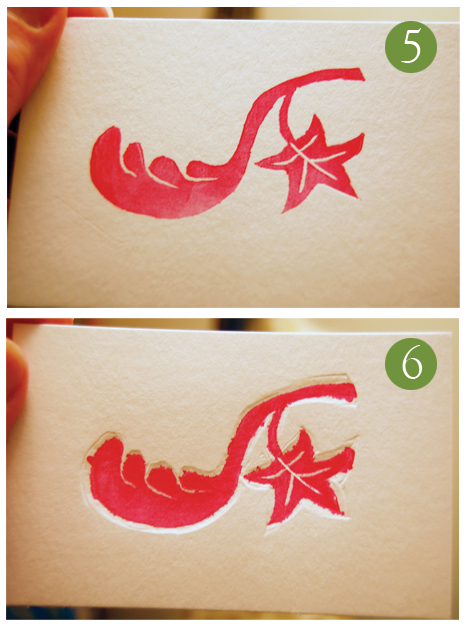 1) I cut a simple little design out of the linoleum. You can see how thin the sheets are. It was REALLY easy to cut through. I really like this product. You can pick some up on Amazon - Easy to Cut Unmounted Linoleum by Richeson. 2) I tried to cut down as far as I could in order to make sure the cut-away areas wouldn't interfere with trying to get an impression. 3) Then I decided just to cut the excess away to prevent it from interfering with the impression. 5) For this first print, I took out ALL of the packing. The only packing that comes with the kit is one sheet of medium weight paper and the clear, plastic board with the grid. I took that plastic board out too because I knew the linoleum was thicker than the dies that come with the kit. When I rolled it through, it was easy to crank, so I knew there would be no impression. But, to my surprise, the Epic Six served as a nice little "printmaking" press. If I had inked my design better it would have been a more even print. The bad inking wasn't really my fault. My new brayer has issues...it must have been on the shelf too long because there is a "dry rot" area on it that the ink doesn't work well on. I'm not sure what is going on, but it definitely has a defect because that strip of rubber is darker and slicker than the rest of the roller. 6) For the second print, I put all the packing materials back in. Obviously, this was too much pressure. The ink spread and the cut-away areas of the linoleum began to press into the paper. I found an alternate use! 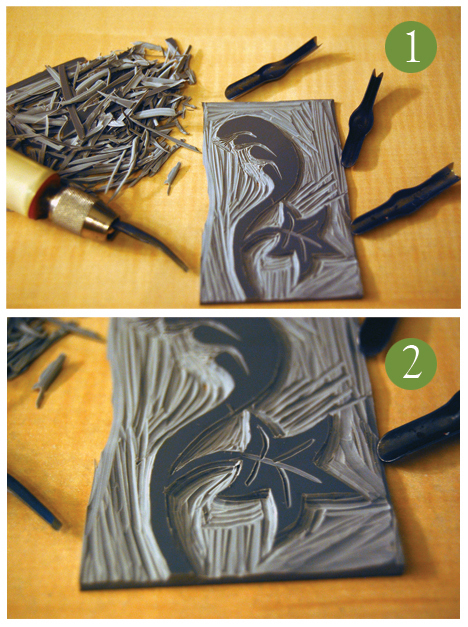 So, I think another neat way to use this little "press" is as a linoleum (sheet only) carve print-making press. If you take out the packing that comes with the press and experiement with your own packing, this press makes a handy way to evenly press a hand-carved design. You could easily come up with your own way of registering your art so that you could print multiple colors. I do not think this thing will EVER replace the quality of a real letterpress. There are serious size limitations and most users will never take the time that you'll need to really perfect the process of making a print on this little plastic machine. Given the low-quality of the ready-made plates, non-art/design users are going to be disappointed with their results and have a hard time coming up with all the resources to make this endeavor worth it. I don't think that letterpress folks have too much to worry about - ultimately, there is no way that anyone can produce commercial quantities on this machine. The process of hand-inking the plate each time and cranking it through each time will limit the number of items produced. 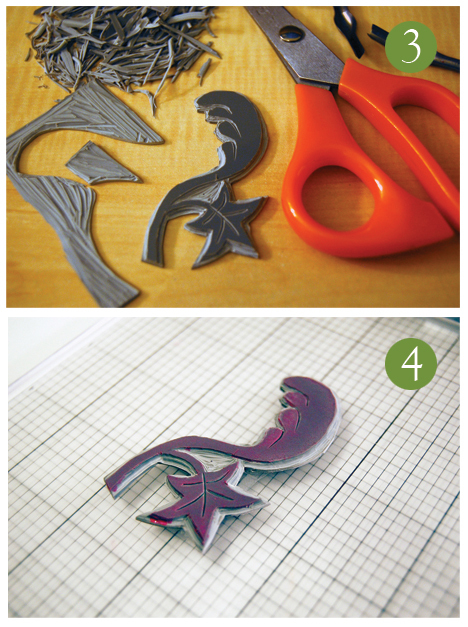 This process is to letterpress what Gocco was to screenprinting. I have ENORMOUS respect for the true art of letterpress. While this machine is fun to experiment with, I yearn for the real thing! As some of you may know, our beloved cat, Figaro passed away this March leaving a gaping hollow spot in our hearts. Our quiet home needed a cat, so we adopted not one, but TWO. Here are my sweet lovely kittens, Friday and Fiona! I've been going home everyday at lunchtime to check on the kittens just to make sure they are staying out of trouble. They like to get on our kitchen table. That is a terrible habit for them to get into, but it's hard to stop the little devils! This book is the most useful quick read you can ever invest in. It took me half an hour to read it, but I already want to re-read it. The Artist in the Office - How to Creatively Survive and Thrive Seven Days a Week is one of those books that just "gets me" and I immediately thought of at least a half a dozen of other people who I know would love it and understand it. In the book, Summer Pierre examines the duality of a creative person - especially a creative person who is "stuck" in a job that renders their creativity seemingly useless. Even if you have a job in the creative industry (which I do), it's easy to feel like you are leading one life for your work and another for your creative self. Pierce takes you through several scenarios that open up your mind to the positives of the "humdrum" job and talks about ways to inject creativity into your daily routine. The ultimate message is to make the most of your days, start now, and take back your life! While it is geared toward artists and creatives, I can see VALUABLE lessons in this book for anyone who is feeling less than satisfied with their work/life balance. This book is a giant pep talk on looking on the bright side and improving your life without making radial, fly-by-the-seat-of-your-pants changes.